Is it possible to let a first sketch become an object, to design directly onto space? The four FRONT members have developed a method to materialize free hand sketches. 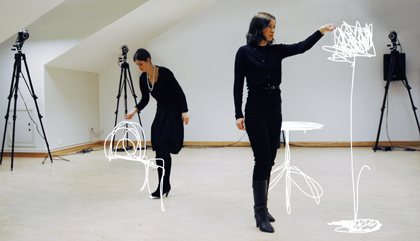 They make it possible by using a unique method where two advanced techniques are combined.Pen strokes made in the air are recorded with Motion Capture and become 3D digital files; these are then materialised through Rapid Prototyping into real pieces of furniture.